The Archduchess Maria Antonia (1755-1793) was born in Vienna, the daughter of the Empress Maria Theresa and her consort, Francis of Lorraine. She was of ordinary intelligence, but her education was sorely neglected, as a consequence, for many years she remained intellectually apathetic and incapable of any sustained mental effort. Louis XV's minister, the Duc de Choiseul, arranged for her betrothal to the Dauphin Louis, the heir to the throne of France, and the two were wed at Versailles on May 16, 1770. France and Austria were perennial enemies, and the marriage was intended to seal the newly forged Bourbon-Hapsburg alliance. 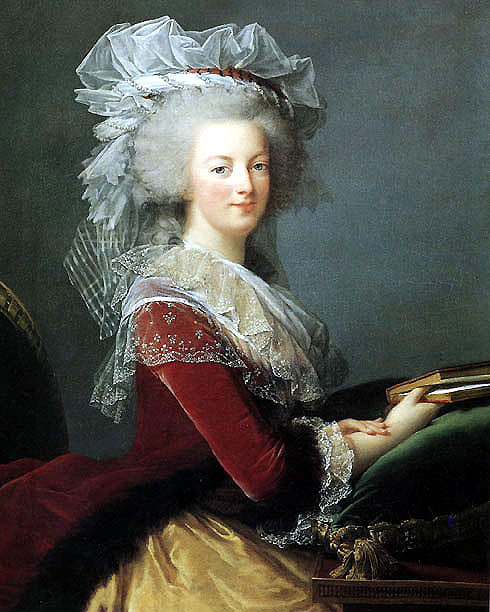 Marie Antoinette's position at the French court was tenuous from the start. Although the old King greeted her warmly, the shy groom demonstrated little affection for her. For various reasons, other members of the royal family, especially Louis XV's spinster daughters (see cat. no. 35<) and the Dauphin's brother, the Comte de Provence, were ill disposed towards her. In 1774, Louis XV died; his weak-willed grandson mounted the throne as Louis XVI, and Marie Antoinette became Queen. Initially the couple enjoyed great popularity, but the young Queen's thoughtless actions soon encouraged malevolent gossip. She purposely flouted the etiquette which regulated life at Versailles, alienating many of the oldest and most powerful families of the realm. Her guide in matters of state was her mother's ambassador, Count Mercv d'Argenteau, and she vigorously defended Austria's interests in the Counsel of State, to which the King eventually gave her access. Her interference earned her the infamous appellation of "I'Autrichienne" (the Austrian woman). Many of those she sponsored for high public office proved to be disastrous administrators; she thus contributed to weakening the monarchy. For years she indulged her every whim, acquiring palatial residences in her own name and surrounding herself with a coterie of unscrupulous self-serving courtiers (like the Polignacs and their entourage; see cat. no. 14). The effects of her unbridled extravagance was onerous indeed on a nearly depleted Treasury. For the first seven years of his marriage, Louis XVI was unable to fulfill his conjugal duties, but in 1778, after he underwent a minor surgical operation, Marie Antoinette became pregnant. A daughter, Madame Royale, was born to them that very year. Three years later the Queen's position was strengthened by the birth of a male heir, the first Dauphin, Louis Joseph (see cat. no. 13). In 1785, the year of the birth of her second son, the Duc de Normandie (the future Louis XVII), she was falsely implicated in the infamous Affaire du Collier or Diamond Necklace Scandal. Public hatred for her was so pervasive that she was generally believed to be guilty. The object of a vicious smear campaign, she was held responsible for the financial bankruptcy of the state and was accordingly nicknamed "Madame Deficit." She was, moreover, accused of every moral depravity. The year 1789 began the tragic phase of Marie Antoinette's life. Both her brother, the Emperor Joseph II, and her oldest son died. The Estates General were assembled, and soon thereafter the Revolution erupted in furor. She saw the monarchy crumbling before her eyes. In October she barely escaped being massacred with her bodyguards when Versailles was attacked by the mobs. The royal family was forcibly removed to the Tuileries Palace in Paris. Dreading the prospect of a civil war, the Queen negotiated for a time with leaders of the Revolution. After 1790, however, she became increasingly isolated. In June of 1791 she and her Swedish lover, Count Axel Fersen, arranged for the royal family's flight from Paris, but they were arrested in the village of Varennes and brought back in humiliation to the capital. 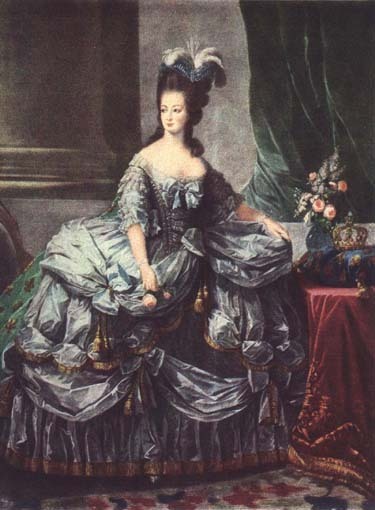 Marie Antoinette and her private emissaries were relentless in their efforts to organize an armed congress of European powers against France, certain that this was the only way to restore the monarchy to its former glory. In March of 1792 her brother Leopold II died, and soon Louis XVI was compelled to declare war against the new Emperor of Austria, Francis II to whom she communicated strategic plans of the French army. In August of that year the Tuileries were stormed, and she and her family were incarcerated in the former palace of the Knights Templar; the monarchy was dissolved and a Republic declared. Louis XVI was tried and later executed on January 17, 1793. The Queen was then cruelly separated from her two children, only one of whom would survive her. Fruitless attempts were made to rescue her. In October, after her transfer to the Conciergerie, her own trial began. In the final days of her life, she displayed a courage that continues to command respect. Found guilty of treason, Marie Antoinette was guillotined on October 16, 1793.
the full-length portrait of Marie Antoinette surrounded by her children (fig. 30). Vigee Le Brun's numerous portraits of the Queen all derive from these four basic "types." (For a discussion of these paintings and Vigee Le Brun's relationship with Marie Antoinette, see Baillio, March and May 1981). The portrait shown here, intended as a roval gift and commissioned through the Ministere des Affaires Etrangeres, is listed in the Registre des Presents du Roi (Document 1) as having been delivered to the ministry in August of 1785. Its beneficiary was the Comte de Choiseul-Gouffier, the French ambassador to Constantinople, to whom it was immediately shipped. Later brought back into Prance, it was found in 1794 among the possessions of Choiseul-Gouffier, who by then had emigrated, and was confiscated by the State (it is included in the Registre de Reception des Objets d'Art and d'Antiquites trouves chez les Emigres and condamngs, dated 28 pluviose an II; original document in the Archives of the Louvre). Among the articles remitted to the care of the Museum Central des Arts, on November 28, 1797 (8 frimaire an VI), it was listed in the inventory of works of art stored at the Depot National de Beaune (Document II). Choiseul-Gouffier recovered his property after his return to France from exile, and upon his death, his widow, nee de Bauffremont, inherited the portrait. In 1837 it was purchased from her estate by a nephew, Theodore de Bauffremont, who in May of that year invited Mme Le Brun, then eighty-two years old, to authenticate it. It was then that the artist scratched onto the canvas her signature and an incorrect date; thereupon she wrote Bauffremont a letter thanking him for allowing her to view the picture (Document III). Here we see Vigee Le Brun in complete possession of her powers as a court portraitist. Although regal in bearing and possessing a faultless complexion, Marie Antoinette could not accurately have been called a beautiful woman. She had a high bulging forehead, pale blue myopic eyes, an aquiline nose, and the thick Hapsburg lower lip. Operating like a plastic surgeon, the artist has modified these unattractive features, yet she succeeds in capturing a more than recognizable likeness. The fabrics are rendered with consummate skill, especially the fur-trimmed jacket and the delicate point-lace collar, fichu, and ruffled engageantes. "Pray what do you think of them, Sir Joshua?" "That they are very fine," he answered. "How fine?" I said. "As fine as those of any painter," was his answer. "As fine as those of any painter, do you say? do you mean living or dead?" -When he answered me rather briskly, "Either living or dead." I then, in great surprise, exclaimed, "Good G ... what, as fine as Vandyke?" He answered tartly "Yes and finer." James Northcote, The Life of Sir Joshua Reynolds, London, 1819, IL 100). PROVENANCE: Painted in 1785 for the Ministere des Affaires Etrangeres, given in that year by Louis XVI to Comte Marie Gabriel Auguste de Choiseul-Gouffier (1752-1817); seized in 1794 and sent to the Depot National de Beaune; later returned to the Comte de Choiseul- Gouffier; bequeathed by him to Comtesse Helene de Choiseul-Gouffier, nee de Bauffremont; purchased after her death by her nephew, Prince Theodore de Bauffremont; Wildenstein, New York, by 1915, acquired ca. 1926 by Edward J. Berwind, New York; Wildenstein, New York, Charles E. Dunlap, New York by 1951; in his collection until 1962. EXHIBITIONS: New York, Jacques Seligmann & Co., Loan Exhibition Illustrating the Work of Fifteen Masters of the Eighteenth Century, November 27-December 15,1928, no. 17, New York, The Metropolitan Museum of Art, French Painting and Sculpture of the XVIII Century, November 6, 1935 - January 5, 1936, p. 10, illus. pl. 54; Pittsburgh, Carnegie Institute, French Painting,1100-1900, October 18-December 21 1951, no. 95, illus. ; New Orleans, Isaac Delgado Museum of Art, Masterpieces of French Painting Through Five Centuries, October 17, 1953-january 10, 1954, no. 47, illus. ; London, Royal Academy, France in the Eighteenth Century, January 6-March 3, 1968, no. 708, illus. fig. 334. SELECTED REFERENCES: Souvenirs, I 331; Helm, [19151, pp. 32-33, 209-210, illus. facing p. 32, A. Blum, "La Fin d'une aristocratie Mme Vigee Lebrun inconnue," La Renaissance de I'Art Francais et des Industries de Luxe, II, No. 11, November 1919, p. 496, illus. p. 494; Blum, 1919, p. 95; L. Reau L'Artfranqais aux Etats-Unis, Paris, 1926, p. 142; Baillio, March 1981, pp. 38, 74 (note 23), illus. P. 36, fig. 3 (color).